FORMATS COMMISSIONERS WHAT ARE THEY LOOKING FOR? NO CREW. NO CONTACT. NO HELP. PICKED UP FOR SEASON 6 IN THE U.S. SEASON 3 RANKS #1 ACROSS ALL CHANNELS IN DENMARK. Source: Gallup Live+SD, eps 2â&#x20AC;&#x201C;5, premieres only. The MIPFormats International Pitch is open to all creators to present their new and original, non-scripted entertainment formats. 5000€ Pitch Prize offered by La Fabrique des Formats and Natixis. 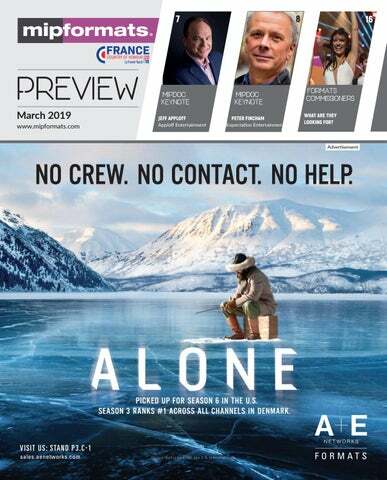 Programme as of February 22, 2019. Subject to change. tion will present five projects during a pitching session on Saturday, April 6 in the Debussy Theatre in the Palais des Festivals at 14.15. Selection of the five projects began back in February. The five finalists, announced mid-March, will now face a live jury that includes: Francois Tron, head of content, RTBF Group, Belgium; Jo Wallace, commissioning editor, BBC, UK; Thierry Ventouras, head of entertainment, RTS-Radio Television, Switzerland; Gena McCarthy, executive vice-president, head of programming, Lifetime Unscripted; and Craig Orr, vice-president, commissioning and development, MTV International. The jurors will be looking for creativity, originality, innovation and the capacity to return for multiple series. Other criteria include the format’s potential to travel internationally and the availability of international format rights. The audience will also vote for its favourite pitch — which won’t necessarily match the choice of the Jury. Last year’s winner chosen by the five-strong Jury was Light My Fire!, a format from BicFormats in Italy, presented by Alex Fiacco. The prize for the company was a development deal with Israel’s Armoza Formats, which sponsored the event. In Light My Fire!, contestants must wear “love shirts” which light up to detect which contestant is most attracted to a potential partner. The audience-choice winner for 2018 was Future Astronauts, from Miroslaw Skowron of Poland’s Mediolia. The show follows a group of teenagers on an astronaut training course that leads up to a simulated mission to Mars. This year’s winner will receive a Pitch Prize of €5,000 to develop a trailer for the format. The prize is provided by MIPFormats partners in the International Pitch, investment bank Natixis and La Fabrique des Formats, a French organisation that promotes and funds the development of format ideas. A chance to have fun and be creative A BRAND new feature of MIPFormats this year is the One-Minute Pitch. The international community of producers and creatives attending MIPFormats will be asked to prepare a one-minute video on their smartphones in which they will pitch their format idea. They will send the video via WhatsApp to a number that will be announced during the event. The call for entries is on Saturday, April 6 between 10.00 and 20.00. The winning pitch will be announced at midday, following the MIPFormats keynote by Peter Fincham, co-CEO with Tim Hincks, of UK production indie Expectation Entertainment. 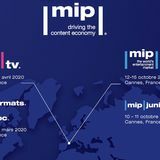 The winner will receive a free registration for MIPFormats and MIPTV 2020.
pon TV, Fuji TV, TV Tokyo, TBS, YTV, TV Asahi, ABC Japan and NHK/NEP. Treasure Box Japan (TBJ) is a joint project designed to promote Japan’s diverse range of unscripted formats destined for the international market — Dragon’s Den, Hole In The Wall and Ninja Warrior are among the global hits to have come out of the country. While Japanese broadcasters have individually been involved in international markets for over three decades, TBJ sees eight of them join forces to boost the country’s presence on the international formats market. TBJ has actively promoted Japanese TV formats at events for almost a decade. Speaker at this year’s event is Naoko Morioka, senior sales manager at TV Tokyo Corporation. t o S pa in . expertise in formats adaptation combined with the world-class Filipino talent, we believe Search For The Idol Philippines can be an avenue to showcase new Filipino singers once again.” The erman adaptation of eshet’s studio-based competition format Masters Of Dance premiered to strong ratings in December last year, on commercial channel ProSieben (10.1% share among 14-49s, and 18.3% share among 14-29s). The 5 x 120 mins series is produced by Tresor, the Munich- and Cologne-based production company that acquired in 2017. Explaining why Pro7 was attracted to the format, general manager Daniel Rosemann, said: “Masters Of Dance for me is the most exciting dance format worldwide. It combines big talent with big emotions.” The original Hebrew version of the series was a hit on eshet . Other territories to pick up the show include orway to public broadcaster , ietnam, oland and Spain. NEW 50-minute format My Big Day: Home Or Away features two top wedding planners who compete to convince a couple that they have the perfect vision for their big day. One plans a wedding at home, the other designs a wedding in an exotic location. A Coco TV production for RTE Television, distributed by BBC Studios, the show follows the couple as they consider all the options and choose between two different dream weddings. THE UK’s Orange Smarty brings format Celebs On The Ranch (10 x 60 mins) to Cannes. Under the supervision of the Head Rancher, the celebrities learn the pressures involved in managing a ranch. Each celebrity is given a horse to look after as they absorb the ways of cowboy life, from learning to lasso to branding the cattle, all leading up to the final when they join experienced cowboys on a cattle drive. The celebrity who each day least impresses the rancher has to leave the ranch and head back to the city. Gradually, numbers dwindle until the ultimate cowboy or cowgirl is named. AMSTERDAM-based L ineup I ndustries is bringing new format T he W eek ends (14 x 50 mins) to Cannes this year. From Radio Gaga and Emergency Call producers De chine en, The Weekends debuted on Canvas (Belgium) in December 201 with Lineup Industries on board for international distribution. With 14 episodes shared over seven weeks, The Weekends is a series that unites nine strangers, ov er sev en w eek ends, to share their stories in a support-group se ng, filmed remotely so no crew is present. E ach indiv idual is going through a v ery important and life-altering year, and throughout the preceding w eek they document their ow n liv es, w ith a small camera, to share in dialogue w ith their group. NO V Y T V channel, from U k raine, brings a number of its ow n non-scripted formats to C annes. E xes helps couples assess their relationship in order to understand w hether they need a restart or separate forev er. T rav el show T rav elE arners features 10 jo urnalists w ho hav e dared to sw ap their profession w ith others around the w orld, in order to understand how it feels w ork ing and liv ing abroad, as w ell as to see w hat k ind dangers can be R e viz o r ( N o vy T V ) hidden behind the most ordinary jo bs. T he R ev izor is a brand that has spurred changes in hotel and catering in U k raine, R ussia and A zerbaij an for many years, and has spawned format spin-offs that focus on retail, medicine and kids. Love Survival features couples whose relationships are in trouble and w ho try to understand, through a series of adv entures and extreme contests, w hether they should stay together or separate. RED ARROW STUDIOS INTERNATIONAL RENO V ATE D on’ t R elocate is a format brought to C annes by R ed A rrow Studios. P roduced by O utline Productions for UKTV, the format mixes smart technology, design and engaging stories to create a home mak eov er show that not only transforms homes, but the w ay they R eno v at e D o n ’ t R el o cat e ( R ed A rro w S tud io s International are used. A n expert host — in the UK version, property developer Sarah Beeny — comes to the aid of homeow ners liv ing in a property that no longer w ork s for them, show ing how a little design know-how can improve their lifestyle, save them money and prev ent them hav ing to go through the stress and cost of mov ing home. Special cameras are installed to monitor how people really use their homes, and the information collected helps create a life-si e floor plan that highlights problem areas and brings the design, layout and decor ideas to life. T he series w ill also be av ailable as a 2 0 x 4 3 mins tape v ersion. MANDARIN FILM CHINA’s Mandarin Film is highlighting its new format Breakout The ade M ask ( 10 x 2 0 / 3 0 mins) in C annes. T he series features a group of close college friends w ho trav el into the mountains during the summer break to explore a hidden w aterfall. T hey div e deep into the w ater and uncov er a jade mask. When they climb back out onto dry land they find the world they come back to is not the one they left. There’s something in the trees hunting them and the only refuge is an abandoned monastery. I nside they learn the secrets of the ade Mask and try to w ork out how to find their way back to safety. T he contestants in the show react honestly to the ev ents B rea k o ut – T he J ad e M as k ( Mand arin Fil m ) happening in real time. FEATURE: FORMAT B UY ERS Network’s head of content, production and development, says. “But these come in addition to long-running series like The Voice and The Block.” Of these, only The Block originated in Australia, though Swift stresses that formats tend to get a serious makeover once they reach the country. “We have a reputation for blowing series up into something much bigger,” he says, pointing to Married At First Sight. to talent about the show they’d love to make and then try to accommodate them because, if you have their buy in, you get a better show,” Rosen says. “I t el l m y c l i en t s t o s t o p s ear c hi n g f o r P r i n c e C har m i n g an d s t ar t l o o k i n g i n s t ead f o r n i c e guy s — i d eal l y , l o t s o f n i c e g uy s d o i n g diﬀerent things” And if you’re lucky, “one of your nice guys will turn into a handsome prince”, Wogue adds. “Formats that start small can, and do, end up big,” she adds, citing TBS’ Ninja Warrior, which started its international career as cult viewing on the now-defunct G4 before morphing into NBC’s unstoppable American Ninja Warrior. K-pop talent search Produce 101. Not only were production budgets spiralling out of control, she adds, but the well of candidates was running dry: “The same people were appearing on different talent shows, since there’s a limited number of ordinary people who are talented in singing.” But if old-school talent shows are struggling, Kim believes studio-based music formats will live on — as long as they are “visually unique, grand in scale and have a new and different approach to the music genre”. Fitting this description to the letter is CJ ENM’s latest contribution to the genre, 300: War Of United Voices, in which top artists and 300 of their fans join forces to give performances of “electrifying scale and harmony”. S is also heavily-penetrated by the big S players s The Titan ames and Fo s The Masked Singer are both performing well. nd there is now talk of ndemol Shine preparing a blown-up version of format Lego Masters for the S market. see big unscripted commissions by the S market. ou get a similar response from Lovejoy and abcock, even though their division is part of a global network of channels e have an ama ing archive of that wouldn t necessarily be a fit for our channels anymore, says Lovejoy. ut it could be reimagined in a big way for other channels or platforms. an attractive option, as we ve seen with ueer ye For Straight uy. ueer ye is a particularly timely e ample, since et i has just unveiled plans to shoot four episodes in Japan. This is a reminder that the streamers, while global in reach, are not necessarily looking to create global versions of shows. aving secured the rights, ogue says, they are able to create as many local versions as they want, tailored towards the local audience . urrell agrees, noting that The eal orld is being made for Facebook by MT Studios in three versions. Facebook s onfetti is another good e ample, since this has been adapted for five territories at time of writing by Fremantle. ommenting on that partnership, Fremantle s director of global entertainment ob lark says ur family of producers gives us the reach and ability to customise the show for local audiences. n other words, the streamer opportunity is not just about licensing the format globally. For companies with international production capabilities, there is also the potentially lucrative task of making multiple local versions. Prepare for MIPFormats Visit the MIPFormats website to organise your travel and benefit from: • reduced rates on your transportation with our partners Air France and KLM Global Meetings with discount code: 34497AF. • the best deals on accommodation with our partner hotels and agencies. • fixed rate taxi bookings of €80 from the airport to Cannes (incl. motorway tax). Japanese Formats Showcase Treasure Box Japan: World Premiere - Brand New Formats & More! MIPFormats buyers can equally access the MIPDoc Screenings Library to screen Factual and Documentary programmes (on presentation of MIPFormats badge). Coffee bar & charging stations. Review the screening reports from dedicated stations available at MIPDoc. As a buyer, you can get your reports directly from the Screenings Library. To access the reports, please log in using the login & password indicated on your badge. These reports will be sent to your email inbox (if you selected this in your contract) at the end of each day.